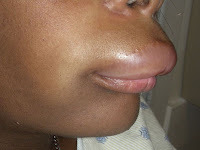 A 41-year-old African American female (AAF) came to the emergency room (ER) with an upper lip swelling which she noted when she woke up in the morning. She denied shortness of breath, change in her voice or wheezing. She had been taking Lotrel (amlodipine/benazepril) for hypertension (HTN) for 6 months. She had one previous episode of angioedema affecting the the upper lip 7 years ago while she was taking Zestril (lisinopril). The previous episode did not involve any airway compromise and was treated as an outpatient. Hypertension (HTN), diabetes type 2 (DM2), obesity. No history of serious allergic reaction in family. Vital signs stable (VSS), in no apparent distress (NAD). HEENT: upper lip swelling, no skin rash, no tongue or eyelid swelling. Abdomen: Soft, NT, ND, +BS. ACE-inhibitor-induced angioedema affecting the upper lip (click to enlarge the images). The complete blood count (CBC) and basic metabolic panel (BMP) were normal. Angioedema due to ACEi without airway compromise, second episode. What diagnostic tests would you suggest? Stop ACEi and start amlodipine (Norvasc) as a blood pressure (BP) medication. Solu-Medrol (methylprednisolone) 40 mg IV q 6 hr, when better, switch to oral steroids. Benadryl (diphenhydramine) 25 mg po q 6 hr (H1-blocker). Pepcid (famotidine) 20 mg po bid (H2-blocker). The patient was seen by an ENT specialist who did not find any laryngeal edema and she was admitted for a 23-hour observation. She was given Solu-Medrol (methylprednisolone) 120 mg IV x 1, and then 40 mg IV q 6 hr. The H1- and H2-blockers were continued. The upper lip swelling has completely resolved by next morning. The patient had no further complaints and was discharged home with oral prednisone taper for 7 days and Benadryl po q 6 hr x 3 days, then prn for itching, rash or swelling. She was advised to avoid driving while taking Benadryl and to follow-up with her primary care physician (PCP) in 3-5 days to check the pending laboratory tests done on admission. Angiodema due to Angiotensin Converting Enzyme Inhibitors (ACEi). ACE inhibitors are the most common cause of drug-induced angioedema. Several reports have also linked angiotensin II receptor blockers (ARBs), such as losartan and valsartan, with the development of angioedema but the risk is much lower. ACE-inhibitor induced angiodema typically resolves within 24 to 48 hours. ACE-inhibitor induced angioedema is an example of idiosyncratic reaction, from Greek, "a peculiar temperament." Adverse drug reactions (ADRs) affect 10–20% of hospitalized patients and 25% of outpatients. What is the cross-reactivity risk when prescribing ARB to a patient with ACE-inhibitor-related angioedema? Can you prescribe ARB to a patient with ACE-inhibitor-related angioedema? Yes, but only for populations that have demonstrated a clear benefit from angiotensin II antagonism, for example, patients with CHF and CKD. The above recommendation has been adopted by the National Kidney Foundation guidelines and the American College of Cardiology and American Heart Association (ACC/AHA) consensus guidelines. Given the strong potential for harm with drug-induced angioedema, however, close monitoring is necessary to ensure that repeat angioedema does not occur with ARB. Cough associated with ACE inhibitors was first reported with captopril in 1985. Early reviews reported a frequency of 1-2% but recent reviews found it to be as high as 15-39%. Cough related to ACE inhibitors usually resolves within 2 weeks of stopping the medication but the median time is 26 days. Incidence of angioedema with different antihypertension treatments. JACI, Beyond Our Pages, Volume 119, Issue 5, Pages 1287-1288 (May 2007). Primary source: Diller et al. J Clin Hypertension 2006;8:649-56. New therapies for hereditary angioedema (HAE). Allergy Notes, 01/2008. Hereditary angioedema, Supplement of Annals of Allergy, Asthma and Immunology, 01/2008. Cross-Reactivity of ACE Inhibitor–Induced Angioedema with ARBs. U.S. Pharmacist. Vol. No: 32:2 Posted: 2/20/2007. Valsartan-Induced Angioedema. The Annals of Pharmacotherapy: Vol. 37, No. 7, pp. 1024-1027, 2003. Treatment of ACE Inhibitor-Induced Cough. Medscape, 1999. Cough and Angioedema From Angiotensin-Converting Enzyme Inhibitors: New Insights Into Mechanisms and Management. Medscape, 2004. ACE inhibitor- versus angiotensin II blocker-induced cough and angioedema. The Annals of Pharmacotherapy, 1998. Angioedema. Maurice Reid, MD. eMedicine. Angioedema. Nedra R Dodds, MD. eMedicine. Chapter 57: Drug Allergy. Allergy and Immunology Review Corner: Chapter 57 of Pediatric Allergy: Principles & Practices, edited by Donald Y.M. Leung, et al. Visceral angioedema due to angiotensin-converting enzyme inhibitor therapy - diagnosed with abdominal CT. CCJM, 2011. The first ACE inhibitor (captopril) was developed from viper venom by a Brazilian post-doc. The FASEB Journal, 2003;17:788-789. Angioedema due to ACE inhibitor. NEJM, 07/2011. Angioedema due to the renin inhibitor aliskiren. CCJM, 2011. The photographed patient gave a written permission for her photograph be taken and used for medical education. I am 51 today with the same upper lip swelling for no reason. The last swelling which started yesterday was not as severe as the picture I see here but I'm quite familiar with this. I don't take medication and I can't quite figure out what causes this but I believe for me this is stress related. My mother died of asmetha so I believe I have inherited some allergies also. I found out when I went to college in the US and lived in a cold (snow) climate for the first time, that I was allergic to ICE so I found out applying ice would make my body swell. I had to wear a ski mask to protect my face and ears. I think this is when it all started. Maybe the shock of the climate change from tropical to snow was too severe. Can ACE induced angioedema occur years after the drug has been started? Yes, the angioedema can start at any time during the treatment with ACEi. My son, who is 22, started taking an ACE inhibitor at least 10 years ago and last week ended up in the ER with severe swelling of his uvula(enlarged to the size of a pinky finger), soft palet and tongue. He is fine now but had never suffered any type of swelling previous to this. He has transposition of the great arteries, a congential heart defect, which required the use of this type of drug. he has since been prescribed an angiotensin II type drug. We need to question his dr. a little more before he takes this drug. He is very afraid this will happen again. It was scary. Just wanted to share our story. good luck to you. I have had angioedema for 10 months now. I had taken Avapro 75mg per day for borderline hypertension 3 years and got anaphylaxis and angioedema when the dose was increased to 150mg per day (happened after first increased dose). It won't go away and despite multiple tests via a specialist no other cause can be found. It is being called "brittle" angioedema and has given me episodes of laryngeal obstruction and anaphylaxis but not "giant lip or face" swelling. I have to take oral cortisone, H1 and H2 blockers and now I am to start a leukotrine inhibitor. I keep an Epipen on me at all times. I also seem to have become hypersensitive to all sorts of things since getting this allergic drug reaction and have to avaoid perfumes, make up, many foods, pollens etc! After taking lisinopril for a couple of months I started experiencing a cough I related to sinus issues which I have regularly. I took claritin and tylenol pm and soon after started swelling in my lips and on the left side of my face. The swelling was not of the nature of this picture but was enough that the characteristics of my face changed completely. The swelling continued over a two day period and involved the tissue around my eye. I started taking Benadryl consistantly for 48 hours and the swelling went away. Now I am concerned that this swelling may return if I continue to take the lisinopril. Any suggestions.. The best person to address your condition is your physician. Not an online community or a website. I'll give you my advice, STOP now and tell your doctor about this webpage and your swelling. I had to go through the hell of swell 4x, 3 that required ER trips to stop before the wonderful Dr at Scripps diagnosed me correctly and put me on Metopolol.. not sure of spelling. I had been taking Lisinopril for about six years when suddenly last weekend I had a violent allergic reaction (my tongue was so swollen that I couldn't close my mouth over it) that required a trip to the ER and an overnight hospital stay. So yes, the angioedema can occur even after years of uneventful use of ACE inhibitors. I had been taking enlapril for several years and on-and-off again I would get swelling of my lower lip, tongue, and some unmentionable places. I had no idea what was going on and had seen my gp several times about this...not a clue from them. Well, my allergist figured it out on my first visit...stoptaking ACEi immediately. I switched to Beta Blockers and haven't had a problem with antiodema since. Thank you Dr. J....! I just had a very scary awakening at 3;00 on March 30 '09 when I awoke to a swollen tongue which was about to cut off my airway. I was rushd to the E.R. and was told this was angio-edema caused by the Benazaphrill I had been on for 10 years. I was admitted to the hospital for 23 hour observation and sent home on Benedryl. This was a very scary situation to say the least. After telling a friend about this she called her Dr. and told her about the dry cough she had had for awhile. The Dr. told her to stop this drug immediately. Thank You. God is Good. cold urticaria is a condition wear ice or cold induces swelling. this is for Hazel. ask your doctor. I'm 41 years old. I'm also having swelling of my lips and cheek. I don't think I'm allergic to any food. The swelling used to happen every week, lately it had been daily. I noticed this happens whenever I feel hot or warm because of the weather. The swelling goes after at least 12 hours. According to some doctors, heat could be the cause. But nothing is definite. I hope I find out soon what causes my swelling so at least I could avoid it. You need to see an allergist who may recommend the appropriate testing in your case. I have been having unusual lip swelling for about 6 months which moves around to different areas of my lips. First the lower left lip, then the upper right, then over to the upper left and finally the lower right lip swelled up hugely and it was difficult to talk. Then my right eyelid swelled hugely and still has an ugly pocket of fluid over the tear duct. The "moving swelling" went on for about 8 hours. I have been on Lotrel for about 4 years. What is going on! I am not aware of any foods that contain ACE inhibitors. Can you list any along with references? Available online 29 July 2004. A group of chemists has identified a possible reason why regular and moderate consumption of chocolate, wine and tea may help decrease blood pressure in humans, as some research findings suggest. In a study to be published in the Jan. 11 issue of the American Chemical Society’s Journal of Agricultural and Food Chemistry, the scientists found that these food products contain powerful antioxidants called flavonoids and that these nutrients can significantly inhibit the activity of angiotensin converting enzyme (ACE) in animal cells, potentially resulting in lowered blood pressure. Here is the link to the entire article , agoodle search for ACE inihibitors in foods reterns more results as well. C'mon now. How many people eat "fermented oyster sauce"?! In addition, they tested the purified extract, not the sauce itself, on rats, not in humans. I highly doubt that the abstract you referenced applies to the statement "some foods act as ace inhibitors" in everyday life. I started ACE Inhibitors about 3 years ago. Tongue swelling every 3 to 6 months. On December 15, 09 a full blown angioedema attack sent me to emergency room. ACE inhibitor was stopped immediately and was put on Carvedilol, Nifediac, and Triamterene. 3 months later, I am still having eye, lips, cheeks and uticaria rashes every 2-3 days. How long does it take to get this out of my system!!!! Went to allergist and I am alergic to NO foods/pollens/weeds etc. Took prednisone and attacks stop as long as I am on the 10 day regimine but then return. Just got out of the emergency room this morning with full attack. Put back on Prednisone and atarax, but how long will it last. Can't take anymore Igor face. Was told it could take up to 8 weeks to get ace out of my system, but 3 months and counting? 3 months is too long to have a reaction after ACE inhibitors was stopped. There could be another reasons or you may have an idiopathic angioedema (unknown cause). Another evaluation by an allergist at an academic center seems warranted. Hello all! About 15 years ago I entered a double-blind high blood pressure drug trial and after one dose ( got the real thing) I had a terrible allergic reaction. My top lip looked like the picture on this web site. The drug was an ace inhibitor. The allergies transferred to food and for the next ten years I could not eat approximately 25 foods (no melons of any kind, nuts, etc.) and had numerous episodes of angioedema. Recently I read an article about olive oil being good for food allergies so I tried it and surprisingly, I was retested last year and I am allergy free. I still carry an Epipen with me and I take olive oil daily. ACEi-related angioedema does not transfer to foods. There is a potential cross-reactivity with some fungus due to the manufacturing process of some of the early ACE inhibitors but this is far from proven to have any significant influence in human trials. In reality, ACEi-related angioedema is not really an allergy since it is not IgE-mediated. It is uniquely related to the medication itself. Early this week I developed the swollen upper lip exactly as in the picture. I had been taking Lisinopril for about 4 years. My doctor told me to stop taking it. Coincidentally(? )the week before and continuing now, I have developed large patches of urticaria and/or angioedema on my abdomen and upper thighs. I took prednisone for the first outbreak, then got the swollen upper lip and stopped meds, then developed 2 more large red patches,saw an allergist who confirmed the ACE inhibitor problem and ordered tests. Those patches went away, then new ones appeared the next evening. One of those is huge. I am trying to figure out if these are related to the same allergy to Lisinopril. Does anyone have other skin problems with ACE inhibitors? I am a 37 year old AA female. My first episode of angioedema was after taking a sulfa drug. 2 years later I had another episode after being prescribed Lisinopril. The first time I had severe swelling in my mouth, lips and cheeks worse than than the pic above. I went to the doctor that prescribed the sulfa meds and was given a shot and sent home. At that point it was my understanding that I was allergic to Sulfa drugs. It took at least a week before all of the selling was gone. This time I went to the ER and had to be admitted for two days. I was dx with angioedema caused by the ACE inhibitor Lisinopril. My entire face was swollen beyond recognition much worse than the pic. Top lip was like a platapus, eyes half closed, cheeks huge! This was soooooo scary for me although I had experienced it before. This can be dangerous if your airway swells. I now have to carry an epipen and I am deathly afraid of taking medication...but have to because of certain medical issues. The swelling contiued even after treatment began. I would recommend seeking medical attention at the first sign of a side effect or adverse reaction if you are taking any kind of medication. Medication is foreign to our bodies and could really be harmful. Just wanted to share my experience, may be helpful to someone. "I would recommend seeking medical attention at the first sign of a side effect or adverse reaction if you are taking any kind of medication." I have been getting these lip swellings for 5 years now. Some are worse than others. The one thing that happens to me which I haven't heard any of the above comments mention is that the swelling moves. It will start on, for example, the right side of my upper lip and then will slowly move to engulf the entire upper lip, moving over to the left side as the right side swelling begins to go down. It will sometimes move to the lower lip as well. This usually lasts for a 24 hour period. Do any of your swellings move from one side to the other? The swelling (edema) often moves. It is also gravity-dependent - most edema types are. I just went to the ER today and my photo looked exactly like the woman above with swollen lips but it was my lower lip. No swelling of my throat just a huge lip. I was also told it was due to my licinopril. Not good. I wish more people knew about this possibility before they started taking the drug. After being prescribed Lisinopril, Atenolol, Amlodipine and Hydrochlorothiazide, I was also informed by the hospital that I had a potassium defficiency. I took my normal medications and a few days later decided it might be a good idea to take a potassium supplement. That was a huge mistake! The next morning I woke up to severely swollen lips, worse than the pic above. The swelling then moved up my face, out my cheeks, to my eyes and forehead. My face basically blew up like a balloon and I can best describe my appearance to resemble a cartoon character. I didn't even recongize myself. Was prescribed oral steroids which eventually took the swelling down completely after about a week. About a year later I took a multivitamin and the same thing happened. Then about a month later I ate a generous amount of spinach each day for about 3 days. Experienced a similar effect except the swelling was mostly in my lips and cheeks and not as bad and healed quicker. I beleive that large amounts of potassium and foods with high amounts of potassium are the trigger for this as potassium somehow counteracts negatively with the blood pressure medication. I no longer take the hydrochlorithiazide or the Lisinopril and avoid any supplements including potassium or any foods especially high in potassium. Not sure if anyone else out there has experienced this??? I am a 36 year old AA female and was just released from ICU because of these same medicine. Unlike the picture above my lips, tongue and throat swoll up and I had to be sedated for three days. The er doctor said if I would have waited 5 more minutes I would not be here. I took lisinopril for about a year then I started having different areas of my body swell. The pharmacist told me that I have to stay clear of all Ace drugs or drugs ending in pril and also blockers which end with art an. I was in ICU with MRSA septic shock that cascaded into three months on heart catheter and PE/endocarditis/DVT/Olsers nodes/retinal abscess/wbc's at 1!Renal failure...To save the eye I had to have a local anesthetic injected and am allergic to all plus epi/adren. Pretreated with cortisone and Benadryl, I was ok for 4 hours.Then my face blew up. At first it was thought to be the ldrug but after recurrant lip/face swelling randomly, I was misdiagnosed as having allergic reactions to penecillian taken 10 days before. I argued that as I'm not allergic to it but it took a RN!!! !to figure it out. C1 C2 esterase defency. Probably had SIRS type of sepsis but not diagnosed as such. As The face got worse I got red patches all over body and hive like welts. Terribly scary and I've never seen others who had this so I want to share. Doctors miss this one a lot. I have taken Ramipril for 10 years and my entire body swells with 3-4 lbs of fluid every week,lasting around 3 days before leaving.I have complained for years but NOBODY has ever told me it was my medication causing this.I printed a sheet and gave it to my Doctor who agreed to try me with Candesartan.So am 3 days in with the tablets.Ok so far but very nervous as I just cant carry on with the swelling as its really ruining my life.So sorry for you all with this problem,but it helps to know that I am not alone.Thank you.